I have a part time early years space. Thursday's only at the moment. I work in line with the EYFS and all current government guidelines. I have a daily / weekly routine e.g. : Out and About - Like to do a morning activity most days - library, soft play, role play centre, playgroups, forest park, visits to the ducks. Bigger day trips in the holiday's eg: farms, zoo, Local museum, visits to the fire station. We make the most of opportunities to do lots of fun things in our community. I provide different activities for the children to do. 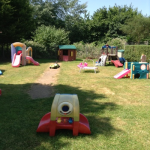 Garden - outside educational area, messy play kitchen, role play, sensory play areas, huge selection of climbing equipment. Indoor play resources- Free flow play, arts and crafts and planned meaningful activities. Perfect for daily adventures for the children to have fun and learn at the same time. I'm fully first aid trained and have completed all mandatory training. In addition I'm continually seeking opportunities to expand my knowledge and experience with additional training workshops. Over the years I've worked with children of all ages with a range of needs. I take a flexible approach to my practice and working in partnership with parents is paramount. My last Ofsted inspection was December 2017 I was graded "Good" by Ofsted. A few quotes from my Ofsted report. childminder has excellent relationship's with children and treats them all with equal concern. Parents appreciate the childminder's flexibility and the loving, secure environment provided for their children. Children's behaviour is excellent. They are well occupied and allowed to follow their own interests, sensitively supported by the childminder. My First Aid, Safeguarding and CRB are up to date. I have certificates for courses & workshops I have been on. Some of which are Child Protection, Safeguarding Children & Health & Safety. A part time early years space on a Thursday. Monday - Wednesday 7.30am to 6:30pm. I will be as flexible as I can to fit around the children’s and your needs. Below are the latest reviews for Dawn Ryan. Please note that reviews represent the subjective opinions of other Childcare.co.uk users and not of Childcare.co.uk. Parents must carry out their own checks and references on childcare providers to ensure that they are completely happy before enaging in the use of their services. My son has attended Dawn's as a couple of one off days. She helped him to settle really well on those days and followed his routine that we asked for. He came home a very contented baby. Happy baby, happy mummy. Her experience as a mum and child-minder are quickly very apparent. Very professional, yet comforting and approachable.